THE VOICE: Tarralyn Reacts to Frenchie Battle! In Tuesday night’s battle round, Team Christina had Frenchie Davis and Tarralyn Ramsey singing their tension out on-stage! At the end of the fight, it was Frenchie Davis who was named victorious by coach Christina Aguilera. In a phone interview Wednesday morning, Hollywood Junket got the chance to talk to Tarralyn about the heated battle and her time on “The Voice”. 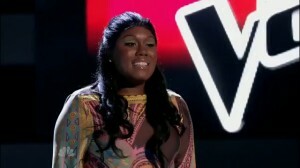 As a veteran singing competition show player, Ramsey who won VH1 show “Born To Diva” in 2003 said that she doesn’t think she does well in competition shows. She also said that she thought that because Davis does not yet have an album, and she herself has made two or three albums that Christina made the right choice in choosing Davis. The biggest hurdle to overcome for some of “The Voice” contestants were the song choices that they were given to sing in the battle round. Tyler Robinson had to sing “Burning Love” by Elvis Presley which as he stated was completely out of his element. “I think it came across and it showed”, he said. Ramsey had to duke it out with Davis in the ring by singing Beyonce’s “Single Ladies”. Ramsey stated, “I tossed and turned day after day trying to make this song relevant to me… they should have given us a SINGING song”. When asked why they thought the coaches wanted to give them songs that were so much out of their comfort zones, Robinson replied “I think it’s to see how we deal with it. They (coaches) want to push us to be our best and make us work really hard.” Regarding how he conquered the Elvis song, Robinson said that he changed it, modernized it. “I was really happy with the song choice after working with it”. The reason why Aguilera gave Ramsey and Davis the “Single Ladies” song, Ramsey said she thought is that “Christina wanted us to do a tempo song that was a little big out of my element.” She also thinks Aguilera was testing their stage presence in order to “expose” their strength their weakness. Ramsey said that she is “very proud of how it came out”. During rehearsals, Ramsey said that they have a couple of days to work on their song. “Everything is taped over a period of a few days. We go to rehearse with Christina 30-45 minutes then worked on the song either by ourselves or with our partner”. Ramsey said that she had worked on the song with Davis only twice before they went on stage. In response to the eye witness accounts of her mother grabbing Aguilera’s arm after the battle winner was announced, Ramsey stated, “My mom was never on the set in the audience.” Ramsey said that the person must have been “someone else in the group”. As for their futures, Robinson said he’d like to try rapping and has been approached by people with interest via Twitter and email. Ramsey said that she intends to take a break from singing temporarily and relax until her contract with “The Voice” ends. She said, “every girl needs to hang-up her mic sometimes”. “The Voice” battle rounds continues next Tuesday, May 24th at 10/9c on NBC.